As we head into proper Winter, good knitwear is at the forefront of our minds. Timeless knitwear is always a great basic piece to add into your wardrobe. Namely something hardwearing and in a colour or print that you love and will wear for years. Long belted cardigans are a stylish and feminine choice. We love to throw them over dresses and skirts for a pretty take on the look. However if you prefer to dress with a more masculine, laid back style, they look amazing layered over a cool t-shirt and jeans. Leave it unbuttoned for a more effortless feel. 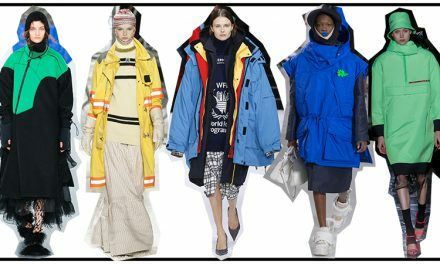 Or we love to use them as an extra layer of warmth under a long coat, just remove the belt to avoid an odd, lumpy silhouette. When it comes to sizing, this style of knitwear is so flexible. Choose a more fitted style that belts neatly at your waist to emphasis a bust and waist. If you prefer an oversize slouchy style, they suit most people. Whichever way you choose to wear yours, we think that a belted cardigan is a great choice for this time of year. And as with everything, if you take care of it, we guarantee you will wear it year after year. Here are our tips to taking care of your cardigan. Pair it with a casual button down shirt and stylish jeans. It can be belted and buttoned or left undone, it’s up to you. If you want to nod to this seasons love of the 80s, replace the belt with a cool wide vintage waist belt. 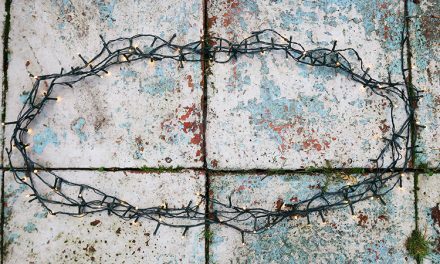 Never hang them, the fibres will stretch, ruining the shape. Always store cardigans folded up in your drawers. When it’s too warm to wear them, protect them from moths using sealed bags. We love the added protection that cedar balls provide from moths. Also try this cedar spray from The Laundress, £7.95, at Selfridges. Hand washing is best for cashmere. Mix a litte cashmere shampoo with warm water and add your cardigan. We love Johnstons of Elgin’s shampoo, £5.95. For other wools, handwashing is advised, otherwise a very gentle and cool machine wash works. Too hot and your knits will shrink! Turn down the RPM on the spin setting to it’s lowest to avoid over stretching the fibres. This happens easily when its wet. Once washed, gently squeeze out excess water and leave to dry flat on a towel. Wool fibres tend to pill due to their delicate nature. Use a de pilling comb to gently remove any bobbles. 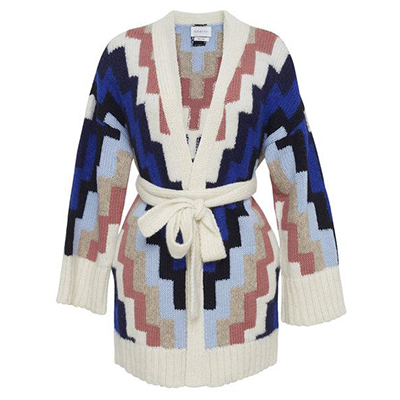 This checked and fringed cardigan is almost like a beautiful belted blanket. The neutral greys and greens are very chic. Give it an elegant twist by belting it over tailored trousers with high heels. 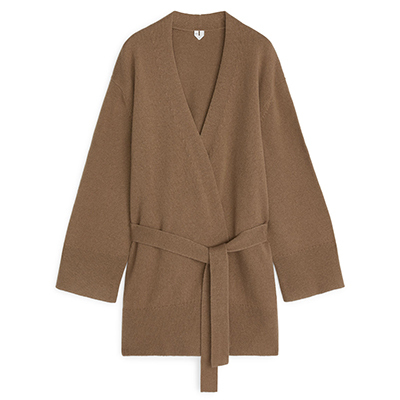 This khaki lambswool style from Arket is perfect for lounging at home. We love it’s simplicity. Plus its thin enough to wear in the spring when you don’t need a coat. Woven by a Peruvian cooperative, this gorgeous cardi is inspired by a vintage sweater made by the same cooperative in the 70’s. It’s super soft, made from sustainably sourced alpaca. And has practical pockets! Hurrah. 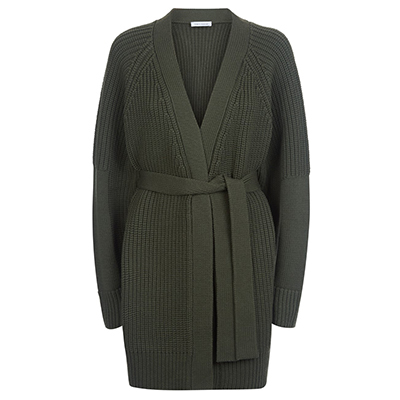 We love this elegant but totally casual belted cardigan from Ninety Percent. The ribbed knit is timeless and it comes in three different colours. 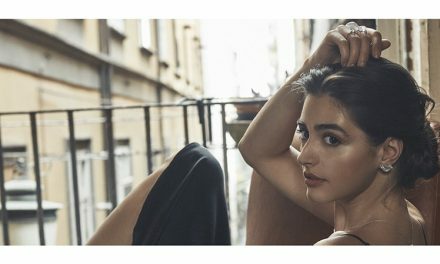 And even better, when you buy from Ninety Percent, they donate 90% of the distributable profits to an organisation of your choice. This classic but very versatile cardigan has 4 belt openings so you can change the style of it easily. Not only that but it’s very soft due to the alpaca fibres used. The pink buttons are a cute detail that make this cardigan a little bit special.